The two LTTE nominees to the Ampara SLMM, Mr. Rasaiah Shanmuganathan and Mr.Aasaipillai Soundararajah are government officials. "We are currently working with the SLMM by taking leave on our own from our respective departments. We cannot continue to function as monitors because it would eventually and technically constitute a violation of the Establishment Code for government departments and we may hence lose our jobs. Therefore to function fully as ceasefire monitors, we have to be temporarily released from service. But if we are to obtain release orders from our departments enabling us to function as ceasefire monitors, we have to submit letters from the government appointing us to the SLMM," Mr. Soundararajah, a government inspector of internal trade, explained. "Our departments will not accept letters from the Liberation Tigers appointing us to the SLMM. So as matters stand today, we cannot seek temporary release from our work to function as ceasefire monitors", said Mr. Shanmuganathan, an assistant director of education. "Functioning as the LTTE's nominees in this manner is seriously jeopardising our future. What is the guarantee that we would be safe from the ire of the Sri Lankan security forces personnel who patently regard our actions with hostility, particularly when we do not have any official accreditation from Colombo?" Mr. Shanmuganathan questioned. Mr. Soundararajah and Mr. Shanmuganathan wrote to Sri Lanka's Prime Minister Mr. Ranil Wickremesinghe on 14 May explaining their predicament and urging him to take necessary action to help them obtain their temporary release orders. The letter was forwarded through the SLMM head in Colombo. There has been no reply from Colombo so far. All the government nominees to the SLMM receive a monthly remuneration of thirty thousand rupees. The LTTE nominees none, Mr. Shanmugananthan said. "We work with our resources," Mr. Shanmuganathan said. The members of the Ampara SLMM nominated by the Sri Lankan government, Mr. Melvin Wijesekera and Mr. A. R. A. Azeez, took part in the dialogue with journalists in Sainthamaruthu, a Muslim town 42 kilometres south of Batticaloa, Monday. During the discussion, the acting head of the Ampara SLMM said according to the Sri Lankan military the LTTE controls only a very small area in the northeastern corner of the district near the border with Batticaloa. 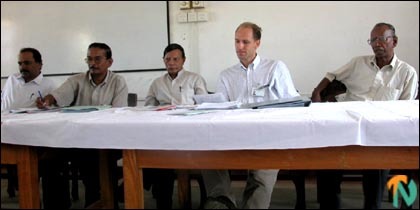 "However, there is no contention in Ampara over demarcation lines because the LTTE has not claimed any area of control in the district so far," Mr. Myklebust said. Article 1.6 of the Cease-fire Agreement between the Liberation Tigers and Colombo states: "The parties shall provide information to the Sri Lanka Monitoring Mission (SLMM) regarding defence localities in all areas of contention. The monitoring mission shall assist the parties in drawing up demarcation lines at the latest by D-day + 30". The Liberation Tigers dominate the large hinterland of the district's southern coast between Potuvil and Thirukkovil, including the extensive Kanjikudichcha Aaru jungles. The SLMM said that the Special Task Force commandos occupy the government hospitals in Thirukkovil and Akkaraipattu.